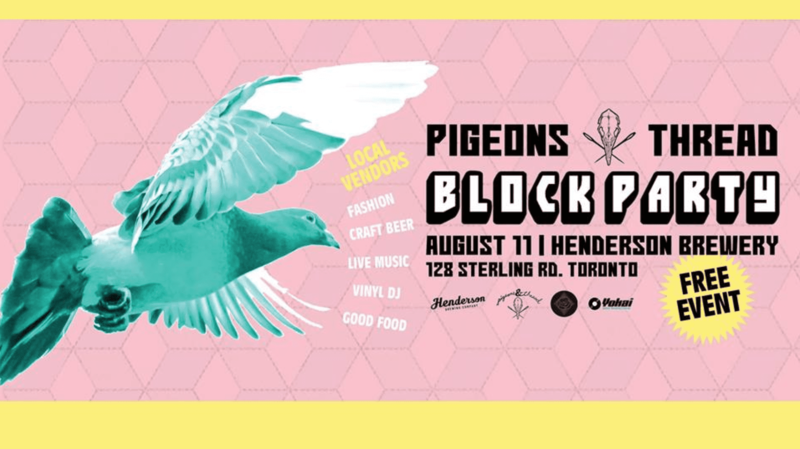 To celebrate five years of being in business, Pigeons & Thread is taking over the Henderson Brewery parking lot for a huuuge block party on Saturday, August 11, and YOU. SHOULD. GO! Beginning at 12:00 p.m., the block party is a FREE, family-friendly event that is jam-packed with music, food, fashion, art, self-care and even free bicycle tune-ups! Come out and celebrate small biz in a big way. The Block Party takes place Saturday, August 11 from 12 to 9 p.m. at Henderson Brewery. For more information and up-to-date info, check out the Facebook event. Pigeons & Thread is a team of powerhouse garment engineers who believe that “Made In Canada Matters.” Collaborating with local Canadian fashion designers and other creative geniuses, their aim is to take over the world, one stitch at a time.